I met Anne Else about three years ago, at a food blogger gathering, when there were only a handful of us in Wellington and it was a bit of a weird thing to do (at least back then when I told people I had a blog I then had to explain it and usually they still didn’t really get it!). Anne was delightful and embracing the modern despite (I hope she doesn’t mind me mentioning her age!) being a generation or more older than most of the rest of us. In fact, it has made her blog more interesting and perhaps more real in some ways – where the 20-somethings are fanciful and impractical Anne is grounded (but far from boring) and has many more stories to tell. 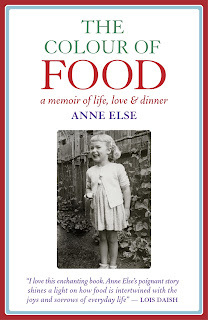 So when Anne announced she was writing her food memoir I was pretty keen to read it - I love biographies and they're even better when there's a personal connection. Despite looking forward to its release (and as luck would have it got a pre-release copy for review, so didn’t have to wait as long as I thought), I hadn’t quite anticipated how she would draw me in with her incredibly vivid storytelling - I ended up reading the whole thing in less than 24 hours. The meals she served up made me feel like part of her family, and starting on familiar ground (her oh-so-Kiwi-childhood in Auckland) somehow meant when she travelled to Albania with her young family I went along for the journey, even though I don't have much common ground there! Her experiences are rich and varied, she is open and honest, and the emotions - at both ends of the spectrum - reach out of the book and grab you the whole way through. If you enjoy food and/or memoirs I definitely recommend this - and as an eBook it's very affordable. If you don't have an eReader you can read it on your laptop, tablet, or even smartphone - I read on my iPad at home and on my phone on the bus on the way home from work. The only drawback to the book being in this format is that the adorable cover photo of a young Anne is not seen so much on an eBook as it might be on a bookmarked hard copy on the coffee table! Are you an eBook fan, or do you prefer being able to turn pages the old-fashioned way? It's nice to see you back blogging Rosa, not sure we are motivated enough again (!) but maybe one day. I am half way through Anne's book and am really enjoying it too. Love my kindle - a total e-book convert! Thanks Becs! I selfishly hope you do at some point but sometimes there are more important things in life (like super-delicious porridge! ).